My First Kenmore Stand Mixer Just $6.99 Down From $19.99 At Sears! You are here: Home / Great Deals / My First Kenmore Stand Mixer Just $6.99 Down From $19.99 At Sears! Sears has this My First Kenmore Stand Mixer on sale for $6.99 (Reg. $19.99)! The My First Kenmore Mixer is a perfect addition to your child’s play kitchen. Your little chef can whip up cakes, pies, cookies and savory dishes using this mixer that features realistic sound effects and lights. 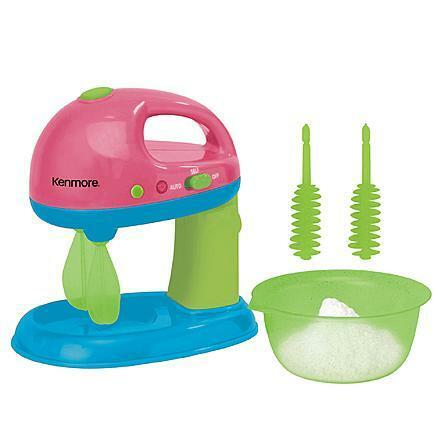 The brightly colored mixer has plastic spinning beaters and a removable bowl, and can also be used as a portable hand mixer for quick, light recipes.